The Norwegian artist Edvard Munch (1863–1944) is today revered for his passionate visual expression of intense human experiences. "Art is your heart's blood," he said. 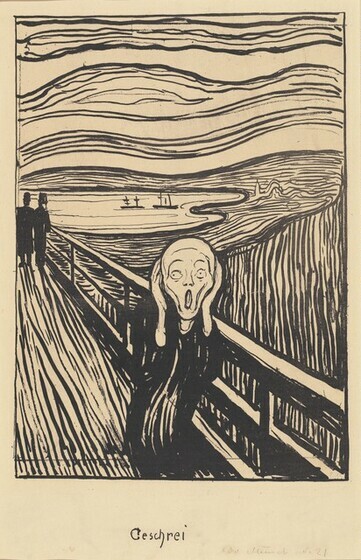 His most famous image—a screaming figure, its eyes wide with horror—is an icon of anxiety, alienation, and anguish. Attraction and love as well as jealousy and death were also recurring themes. His continual reworking of these subjects is commonly linked to Munch's personal struggles. As he himself observed, "Sickness, insanity and death were the angels that surrounded my cradle and they have followed me throughout my life." Before he reached the age of thirteen, Munch's mother and older sister both succumbed to tuberculosis; later his brother died from the disease and another sister was diagnosed with a mental illness. The artist too was stricken with health problems that cast a shadow over his adult life. The real power of his art, however, lies less in his biography than in his ability to extrapolate universal human experiences from his own life. Raised in Oslo (then called Christiania), Munch studied at the Royal School of Design, where he fell in with a group of bohemian painters and writers. In 1889 a state scholarship enabled him to study art in Paris. There he encountered avant-garde art and declared his belief in the necessity for art to depict "living people who breathe and feel, suffer and love." 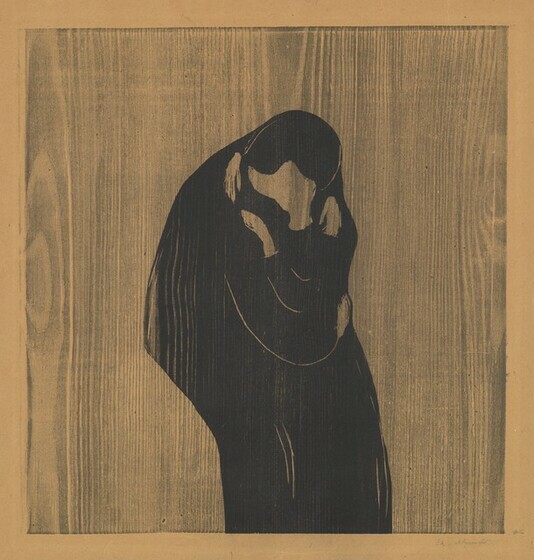 Printmaking was an essential component of Munch's art following his introduction to the graphic media in 1894. With the capacity to produce multiple works from a single plate, stone, or woodblock, printmaking served to expand the accessibility of the artist’s themes to the general public and to provide income. It also enabled him to experiment with his imagery: by altering color, line, texture, and composition, Munch drastically changed the appearance and emotional impact of a given subject. Thus a woman kissing a man could appear amorous in one print, predatory in another; a sick child could seem feverish in one impression, ashen in the next. This exhibition illustrates ways in which Munch reworked and transformed numerous images over the course of his career. At times he explored a single subject through the techniques of drypoint, etching, lithography, or woodcut. He also excerpted details from one print and inserted them into another. The artist gave new life to earlier works by recycling his printing stones, woodblocks, and plates, altering their compositions, and varying the printing inks and papers. Some of his most dramatic prints were achieved by hand coloring individual impressions after the works were pulled. Such extensive exploration with the printmaker’s toolbox inspired Munch’s continual reinvention of favorite themes.